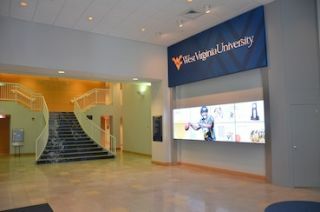 West Virginia University (WVU) is using X20 Media's Xpresenter digital signage platform to drive a new 2x4 video wall. Located in the lobby of One Waterfront Place — home to the WVU Visitors Center, admissions office, and more — the video wall provides a personal welcome to prospective students on campus tours. "Xpresenter has been powering our campuswide digital signage network for the last two years," said Spencer Graham, manager of operations for WVU Information Stations. "In that time, the platform has proven to be a simple yet powerful solution for a range of applications, from keeping students and staff informed with University content to integrating with interactive social media technologies. So we knew that the platform would deliver a remarkable visual experience for our video wall, while making it simple for our staff to schedule content. As expected, Xpresenter has delivered." WVU's Visitors Center is the university's primary recruiting portal. Visitors are greeted by an attention-grabbing video wall in the lobby consisting of eight 46-inch Samsung monitors. All video and graphic content is choreographed and then played out by Xpresenter. In addition, to provide a personal touch for campus tours, each prospective student's name is featured on the video wall with a welcome message. "Xpresenter is a tremendous product for standard signage, but its capabilities allow for so much more," Graham said. "Our video wall is a truly eye-popping deployment that does a fantastic job of marketing the University. I can't wait to see what we do next with the platform." X2O Media's Xpresenter is an end-to-end platform designed to make creating, managing, and distributing broadcast-quality digital signage content on networks of all sizes available to all. Xpresenter's patented authoring module allows Microsoft PowerPoint users to produce compelling content that incorporates animations, video clips, and real-time data sources — all within the PowerPoint interface.